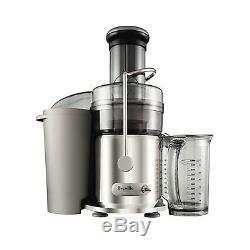 NEW Breville Juice Fountain Max BJE410 Juicer Mouth-85mm For Whole Fruit Vegetable. Keep the Nutrients 69.5% of Vitamins & Minerals Made it to Your Glass On average Keeping juice cool is an important element in preserving nutrients Breville's Nutri-disc spins fast to extract the nutrients, but doesn't heat up the juice. Extra Wide Feed Chute Almost all Breville juicers are designed to juice whole fruit without chopping or slicing. Some juicers also have Breville's unique extra wide chutes that are another 25% larger (85mm diameter) to accept even bigger fruit. Micromesh Filter A thinner mesh reduces the surface area between the fruit and the cup. These unique Italian made filter baskets have almost 40,000 tiny pores. External Pulp Ejection All Breville juice extractors automatically eject the dry pulp into a collection basket while juicing. Most Breville juicers also have this pulp collection basket located externally for easy clean up and minimal down time when juicing many litres at a time. Easy Clean Design Smooth, rounded parts without food traps prevent pulp from sticking and make rinsing under the tap fast and simple. The easy clean models also come with a specially designed scrubbing brush to clean the filter mesh quickly and easily. Products Model : Breville Juice Fountain Max BJE410 Power : 220-240V / 60Hz / 1200W Size : 280(w) x 190(d) x 410(h) Material : Stainless Steel Blade Type : Titanium Reinforced Cutting Disc Pulp Container Capacity : 3L Juice Jug Capacity : 1 litre with froth separator Speed Control : 2Level Safety Lock : Yes. Most electronics from Korea have voltage 220V / 60Hz. If you don't use one, it may cause malfunction or product failure. If the plug type is different, please request for a multi adapter(Korean plug type is'C','F'). Some countries (Italy, Lithuania, Malta, Honduras, Kuwait, Uruguay, El Salvador, Iceland, etc) are not in EMS coverage. An invoice is added on the package on demand. Instead of box, in many cases, air cap is used for packing. If an item suddenly breaks down or does not operate in a normal way within 1 year, the problem will be analyzed and discussed. If it turns out to be a manufacturing defect. If it turns out to be a user's mishandling fault, the item can be repaired. We try our best to put customers' sastisfaction as first priority. Most of the time we find the resolution that satisfies customers needs. Please don't be so quick to leave negative/neutral feedbacks. We really appreciate your business with us. The item "Breville Juice Fountain Max BJE410 Juicer Mouth-85mm For Whole Fruit Vegetable" is in sale since Wednesday, July 9, 2014.